Age specific Speed, Agility, Strength & Conditioning training plus nutritional expert. Use of indoor pool, indoor 5 a side , PS4 FIFA Tournaments, basketball & tennis courts, incredible gym. Award Ceremony - awarding effort and achievement - most improved player, best player and many more! 2019 5 Day Football Camp - July 29th - August 2nd 2019 - South of London - Outfield Players - Ages 9-14. LIMITED SPACES LEFT! Thanks for wanting more Information on our Ultimate 5 day football training & trial camp for players aged 9 to 26 years old. Please watch the video on this page for a full description of how our football camps work and take a time to read our player and parent feedback on FEEFO. There is nothing in the world quite like this footabll camp and we feel sure you will LOVE the experience! If there is anything you are not sure of that is not mentioned in the video, feel free to call us on 07791588891 or email us on info@ukfootballtrials.com and a member of the team will be able to help. Hope to see you at one of our events for your chance to develop your game and get scouted. This will be the ultimate training & trial camp for serious goalkeepers! The goal keeper spaces are strictly limited to just 4 players per age group with a designated ex Premier League Player as your coach, who has managed at National level and been a pro club assistant Manager... it will be an incredible experience for the goal keepers. Please watch the video on this page for a full description of how our football camp will work and if there is anything you are not sure of that is not mentioned in the video, feel free to call us on 07791588891 or email us on info@ukfootballtrials.com and a member of the team will be able to help. 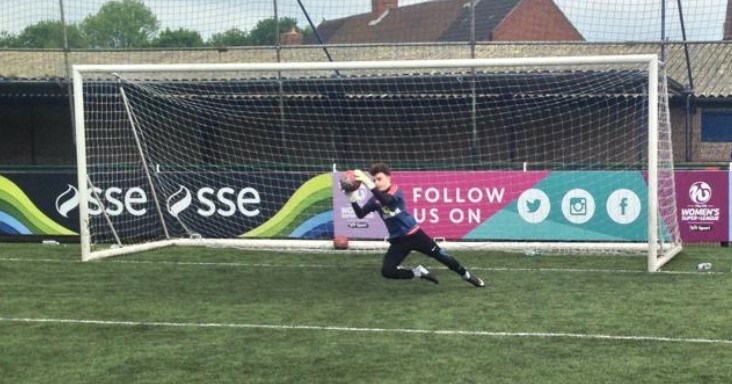 2019 5 Day Football Camp - August 5th - August 9th 2019 - South of London - Goalkeepers ONLY 3 SPACES LEFT - HURRY! Do you want the chance to develop your football ability AND showcase yourself to pro club scouts? If YES, then our 5 day football trial camps are perfect for you! We have the ultimate football training camp which includes our world famous UK Football trials. Our UK Football Trial camps are a 5 day football / Soccer Showcase which will allow you to show your skills in an elite youth football camp environment. You may have attended summer football camps or football training sessions before but we are confident you will not have experienced a soccer school, sports camp or UK football camp like this. At our soccer showcase, we use elite football coaches to give you the very best football training experience for the first four days of the programme. Each day you will get 3 hours of professional coaching, mixed with match situations, learning tactical skills and developing the key areas of your game to help you get scouted. This is the ultimate course to develop you as a player, help you understand how to train like a pro on the pitch... BUT - we go into developing you MUCH more! We use a world renowned speaker who will give you incredible unique insights into the mind set of professional football players and he will help to instil unshakeable confidence for you both on and off the pitch. On our football camp, we will also show you the BEST way to train your body, making sure you know how to develop amazing speed, agility, power and fitness. Learn from an expert about what core strength is and the best ways to improve it. Rest assured that on our football residential soccer showcase camp, you really will learn all the secrets to give your game the edge and take it to the next level. On the fifth day you will get the chance to enjoy an extended version of the UK Football Trial - a 4 hour football/ Soccer Showcase featuring elite football training and professional soccer coaching followed by a football showcase match played in front of scouts. The 5 day football camps will take place in April and also in the traditional football summer camp time of year in August. Ensure you watch our videos and register with us now as spaces for our football/ soccer camps are limited! If you have any questions about how the football training or the soccer showcase works then please do call us on 07791588891 or email us on info@ukfootballtrials.com between Monday and Friday 10am to 6pm where a member of the team will be able to help.